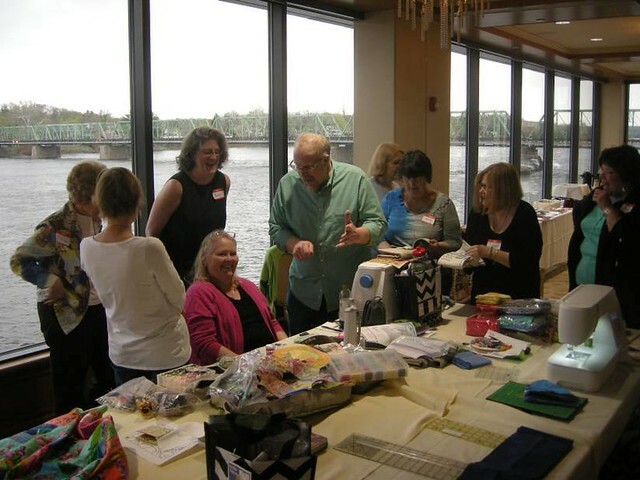 The second phase of my east coast trip ~ and the primary reason for the entire trip to begin with ~ was to attend the Slow Stitching Movement Retreat in Lambertville, New Jersey! Jill, who was also attending, picked me up from my cousin's house on Tuesday morning and we made the lovely drive to Lambertville, chatting like old friends! 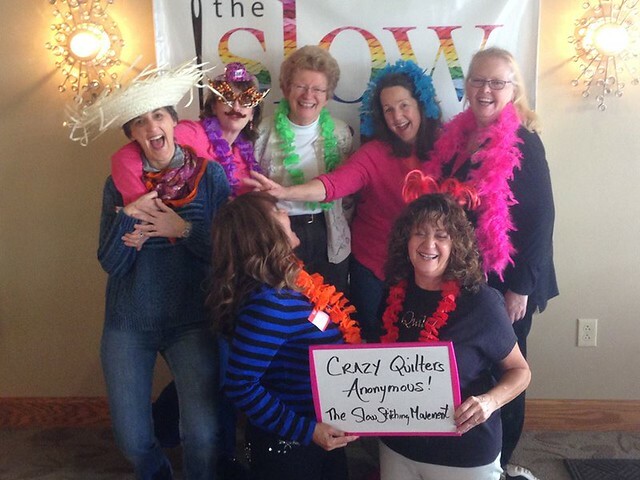 That's one of the things I love about stitchers and quilters ~ they are so easy to get to know! 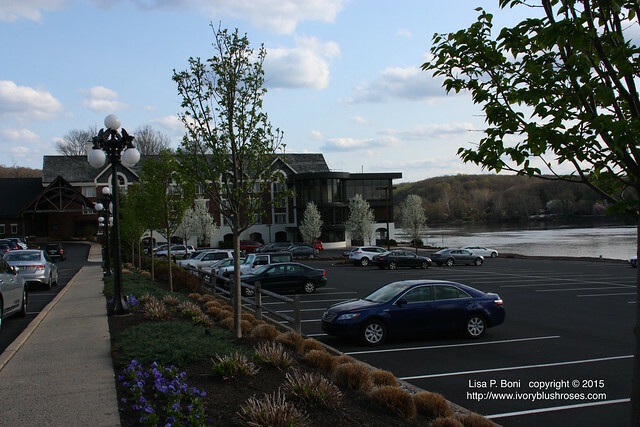 The Lambertville Station Inn where the retreat was held, was situated right on the Delaware River, just a few miles upstream from where Washington crossed the Delaware! Beautiful spot and a truly lovely Inn! The views from the room where we spent most of our time had a beautiful view of the river and of the bridge across it to New Hope, Pennsylvania. 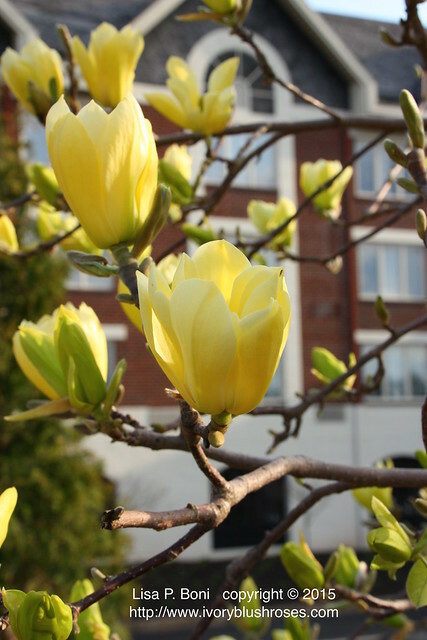 Spring was coming on strong and the tulip (magnolia) trees were bursting into bloom! So gorgeous! 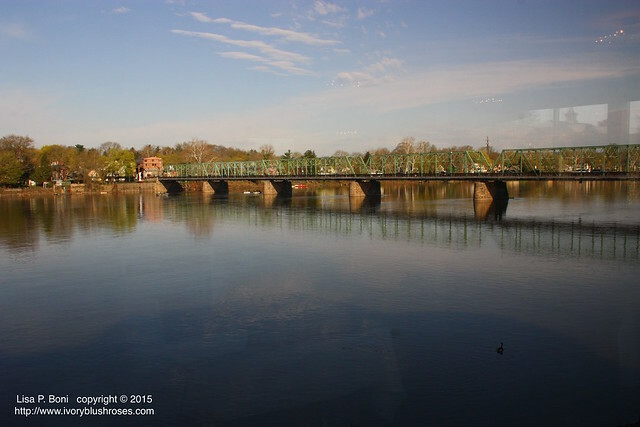 On the first afternoon, there was a walking tour though Lambertville with a tour guide from the Historical Society. It was a lovely look at the town! 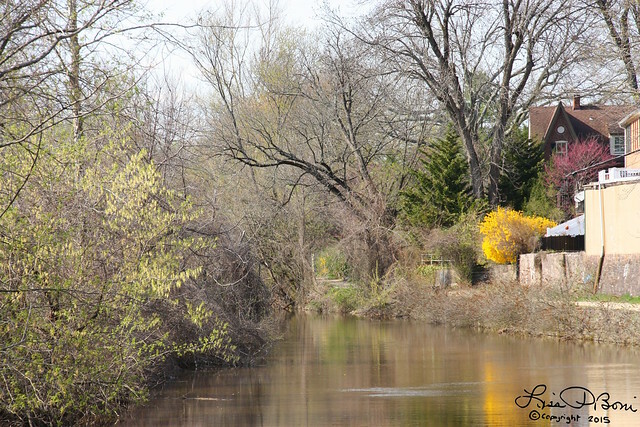 The Delaware Raritan Canal runs through it with a walking path alongside. I'd have loved to take a walk along it, but unfortunately, after this first afternoon there, the weather turned quite chilly and rainy ~ not very good walking weather! 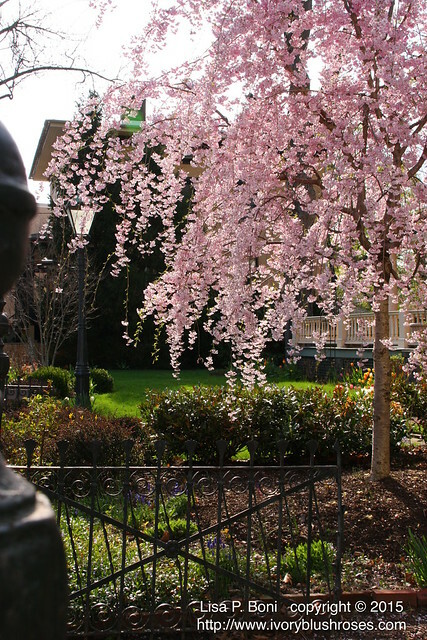 All over Lambertville, the trees were bursting into bloom! So gorgeous! 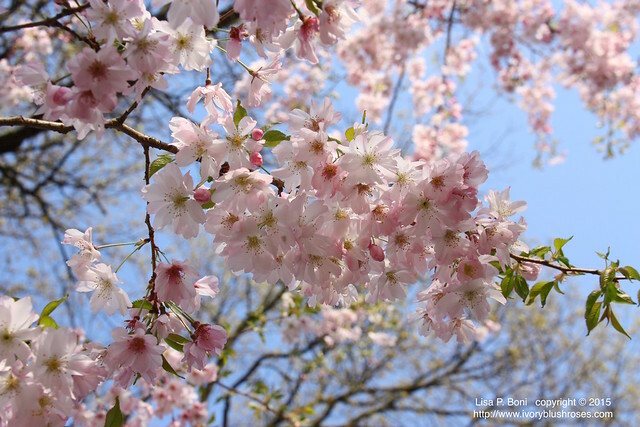 Those beautiful pale pink blossoms have to be the epitome of springtime beauty! 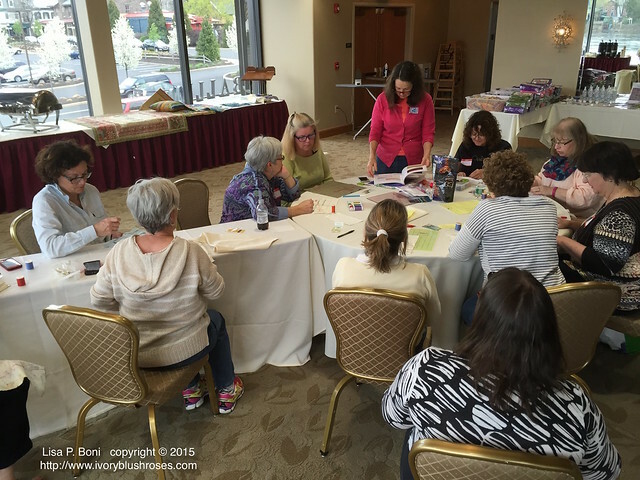 Each morning, there were Slow Stitching exercises. Writing daily pages in the early morning ala Julia Cameron (The Artist's Way) and then a time of slow stitching. Each day the focus was a bit different, but the idea was to truly focus on our stitching, to work meditatively, to be really aware and involved in the process. We had been told to bring 24 strips each of light and dark fabrics that were 1½" wide by the fabric width, and to use only fabrics from our stash. For me, this turned out to be quite a challenge as I almost never buy fabric yardage anymore, usually purchasing fat quarters. Eventually, I came up with just enough strips. During our slow stitching exercises, we used them to create simple Log Cabin blocks. I look forward to completing more blocks to finish using up all the strips that I cut. I'm also thinking about combining them somehow with some crazy quilting. 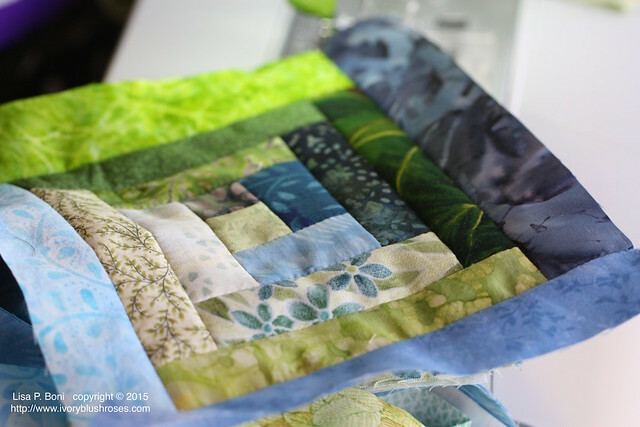 I'm really happy with the blue and green themed fabrics that I used! That's Mark Lipinski in the turquoise shirt. He made the rounds of the room throughout each day, giving encouragement, making us all laugh, and generally inspiring each one of us! 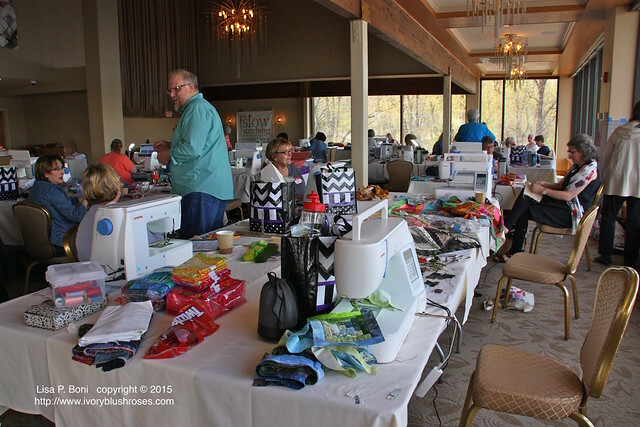 Those black and white bags you see on the tables were our goodie bags that he engineered, filled to overflowing with all manner of things from fabric, a mug, various sewing supplies, a book, patterns, quilt batting, etc. Each day there were workshops that we could attend if we wanted to to. 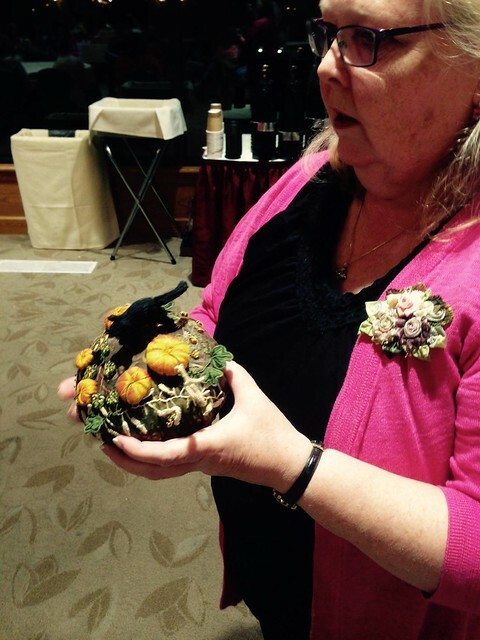 Allie Aller taught two different workshops. 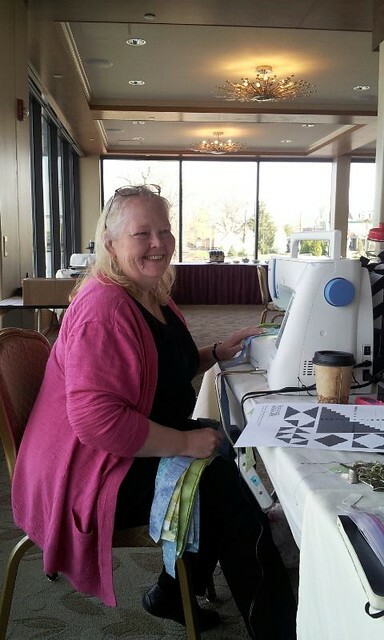 Here she is teaching about combining decorative machine stitching with had stitching to create lovely crazy quilt seams! 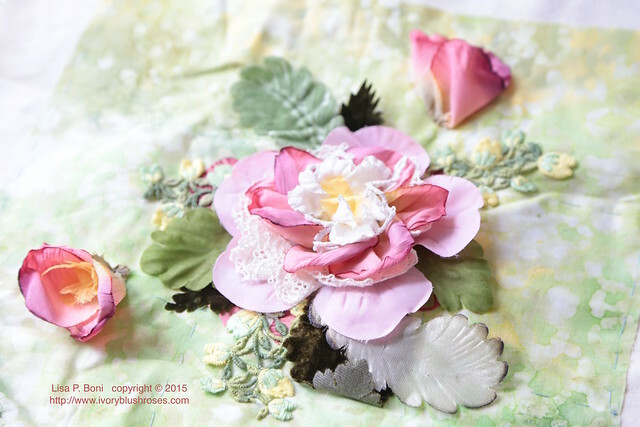 I took her class on creating composite flowers using lace, trims and miscellaneous silk flower petals. As you can see, I really had fun with this! 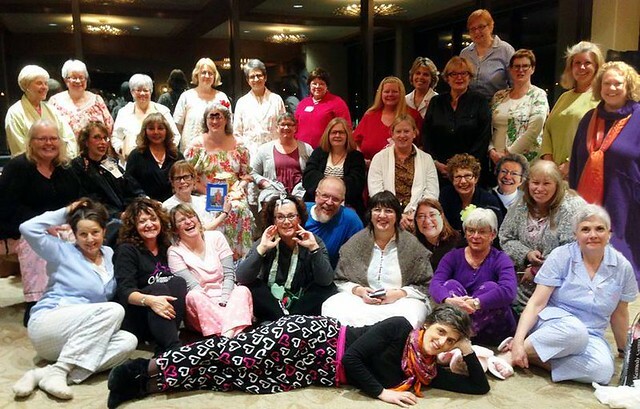 Allie and I weren't the only crazy quilters present! It was lovely to meet these lovely ladies and see their exquisite work in person! (front row) Lydia Aguayo Talton, Arlene Delloro, (back row) Jocelyn Ausseil, Mary Anne Polovich Griffin, Elaine Larason, Allie Aller and myself. As Mark made the rounds of the room with his entourage, they reached my quiet corner of the room! The response to my work was truly amazing (and to tell the truth a bit overwhelming!) Allie captured a few photos of the moment for me! Truthfully, I was a bit awed and amazed by everyone's reaction to seeing my work! Normally, I'm pretty quiet, usually looking for a corner out of the central hubbub of things! 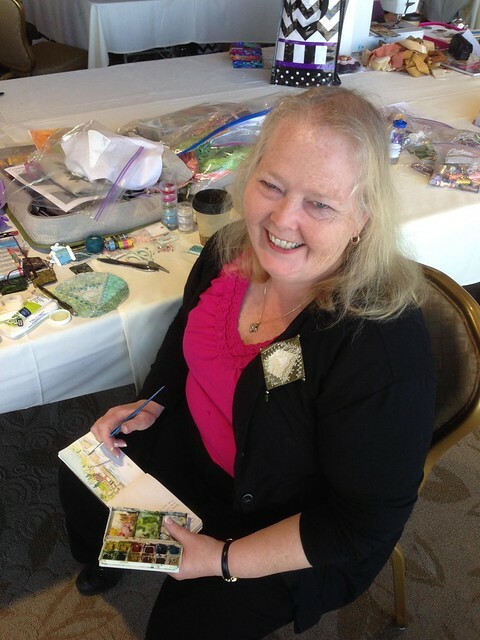 Here I am working on one of the slow stitching exercises! One evening, we had show and tell. I brought my cream and white quilt to show along with two of my pincushions. 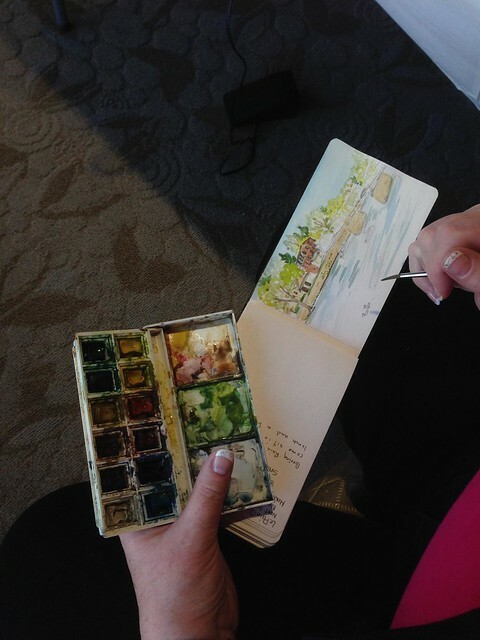 I also found a few moments one morning to do a watercolor sketch of the river outside the window! Once again, Mark found me and brought it to everyone's attention and took these photos! My little sketch in progress! Ireat because I really wanted to meet Allie and it seemed like a great opportunity! 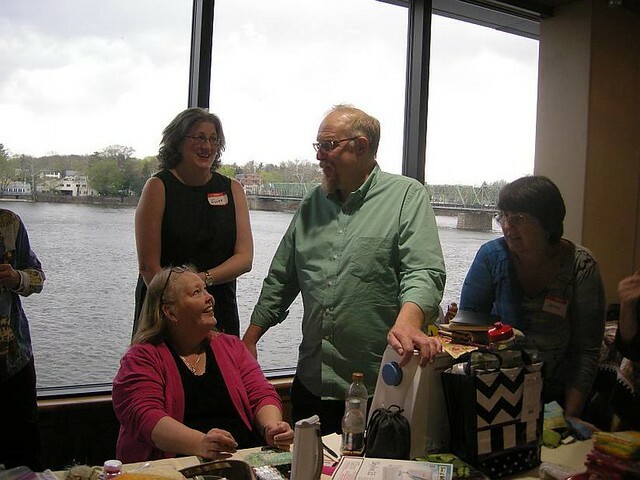 Not only did I get to spend three lovely days stitching next to Allie and taking her workshop, I got to meet so many other terrific women and Mark ~ amazing stitchers and quilters all! It was a wonderful 3 ½ days! It is obvious you all had a great time. Love your little sketch, the flower you created, and your blue/green quilt block. I' m not in the least surprised that you knocked their socks off with your work. Your ivory quilt is absolutely the best. You can do it all and exceptionally well. I look forward to your posts, and when I see one in the que, I skip to it first to see what beautiful work you have produced. Whether it be birding, photography, gardening, watercolor, or needlework, it is a joy to admire. Love the water sketch... Was just showing Hugh, who commented 'wow'. Your fabric creations are amazing. What a great trip! I would have loved to witness them discovering your handwork! I have always been so proud of your many artistic skills! Lisa, it's not surprising to hear they were wowed by your work. It is breathtaking..